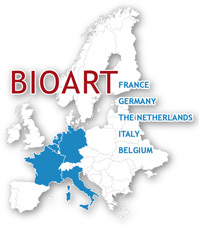 BIOART is a training network. Its aim is to develop innovative (bio)-artificial devices for the treatment of kidney and liver diseases. 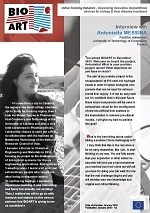 The project gives 11 PhD students and 5 Post-doc researchers the opportunity to carry out individual projects and gain experience by working abroad in partner academic institutions and companies. One line of research focuses on improving the ability of artificial and bioartificial kidney devices to remove uremic toxins from blood. To this end, 2 prototypes will be developed. A second line of research focuses on developing prototype bio-reactors ensuring the viability and functionality of liver cells. Consortium of 11 universities, research institutes and companies from the Netherlands, France, Italy, Belgium and Germany. Budget: 3.8 M€ from the EC. Start date/end date: BIOART started in December 2012. It ends on November 30th, 2016. The BIOART researchers are proud to announce that they have developed a key component needed to create a bioartificial kidney. Research is getting one step closer to replacing dialysis by a bioartificial kidney. A key component needed in a bioartificial kidney is a “living membrane” and this is just what Prof. Stamatialis, Prof Masereeuw and their colleagues managed to achieve. Their results were presented during Kidney Week, in Chicago, USA, in November 2016. "a dream that came true"
Vittoria defended her PhD back in March 2016. Read what she says on her 3 years as BIOART Fellow: "BIOART's programme and its competitive European financial support guaranteed me the best environment, resources, and training to perform my research with adequate means and renovated enthusiasm." BIOART's Final Event was held during the ESAO Congress in Warsaw, Poland, on September 15th, 2016, as a specific thematic symposium, open to all ESAO participants. ESAO is the European Society for Artificial Organs. 4 BIOART Fellows shared their results and got more practice talking to an audience during a BIOART symposium at the TERMIS-EU conference on June 30, 2016 in Uppsala, Sweden, along with 2 senior researchers involved in BIOART. 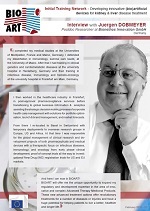 The TERMIS-EU conference was devoted to future regenerative therapies. 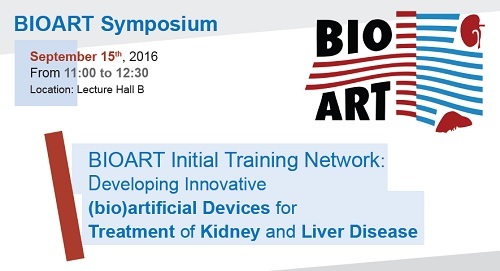 BIOART's symposium was entitled Innovative (Bio)artificial Devices for Liver and Kidney Disease. Click on the picture below to see which labs and companies the BIOART Fellows have already visited since 2014. The BIOARTists and their supervisors got together in Toulouse, France, to report on their research activities and benefit from a full morning devoted to courses. 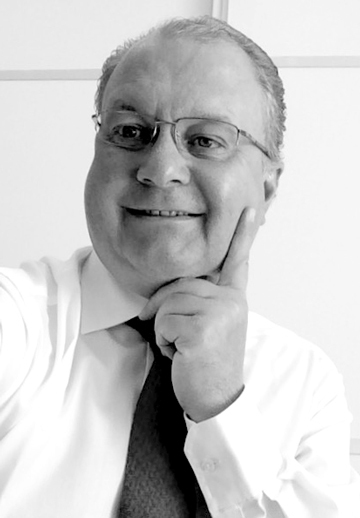 We are pleased to welcome Juergen on board BIOART! 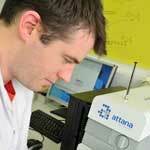 Juergen joined BIOART in January 2016 as a postdoc at Bionethos Innovation GmbH in Germany. He works on regulatory procedures, review of available literature and publications including benchmarks from other health care or pharmaceutical/cosmetic/medical device development activities for advanced and complex medicinal regenerative products for human use. 9 BIOART Fellows participated in renowned conferences in automn 2015! Denys, Dmytro, Natalia, Shervin, Vittoria, Milos, Valentina, Haysam and Michele were at ESAO, Euromembrane, TERMIS and WCRM for oral and/or poster presentations. Congratulations to all of them! Click on the picture below for a look at the titles of their presentations. 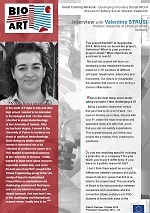 Discover the latest batch of interviews conducted with BIOART PhD students (click on the pictures below). You'll gain insight into their background, research objectives and what is appealing to them in being researchers. Dr. Dmytro SNISARENKO (BIOART Fellow) defended his PhD at Paul Sabatier University, France on November 7th, 2016. And he then immediately started a new job as R&D engineer in the Filtration Technology Research company based in the Paris area. Congratulations to him! 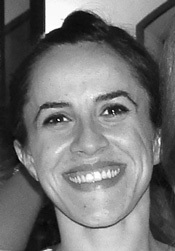 Dr. Vittoria PANDOLFI, a BIOART Fellow who defended her PhD in March 2016, has been hired by Leica Biosystems, in Dublin, Ireland. She started working there in November 2016, as image analysis research associate. This position is linked to "AIDPATH: Academia and Industry Collaboration for Digital Pathology", an international project focused on developing efficient and innovative products for digital pathology. AIDPATH is an IAPP Marie Curie Action (European Union's FP7 Framework Programme). Congratulations Vittoria! Oct 2016 - Denys PAVLENKO (BIOART PhD student) is main author for an article just released in Scientific Reports. The title of the article is: "New low-flux mixed matrix membranes that offer superior removal of protein-bound toxins from human plasma". SECOND BIOART FEllow defended in November 2016! Dmytro SNISARENKO, BIOART PhD student at Paul Sabatier University, France, defended his PhD on November 7th, 2016. Dmytro worked on developing an artificial kidney. BIOART's Final Event took place during the ESAO congress on September 15th, 2016 in Warsaw, Poland, as a specific thematic symposium, open to all ESAO participants. An internal final Progress Meeting was also organised in Warsaw at the time of the conference.